In the past camera based home security cameras were expensive and required professional installation. Thankfully as technology has improved the cost of this type of security has come down dramatically. 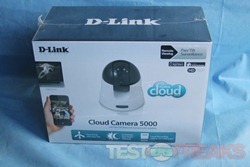 D-Link recently released the Cloud Camera 5000, a surveillance solution designed for the home or small business. This is their top of the line model and has several enticing features. 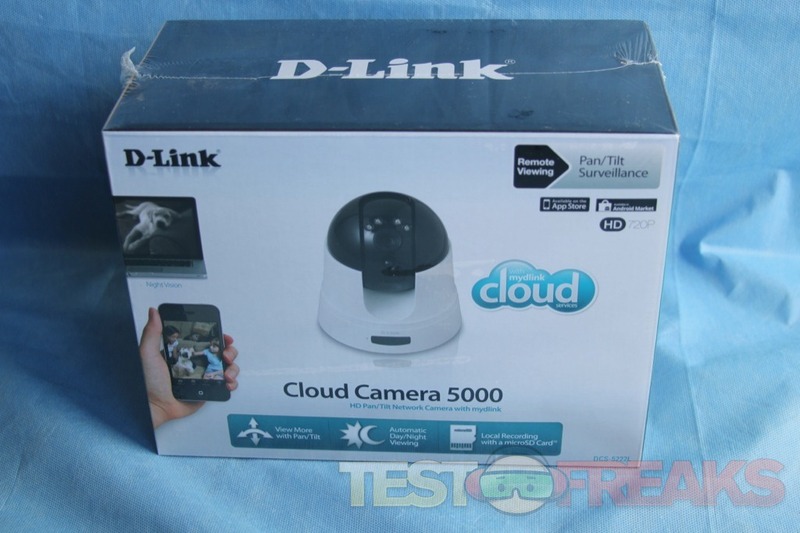 The Cloud Camera 5000 is remote control enabled with pan/tilt function, night viewing capacity and local recording via a micro SD card. 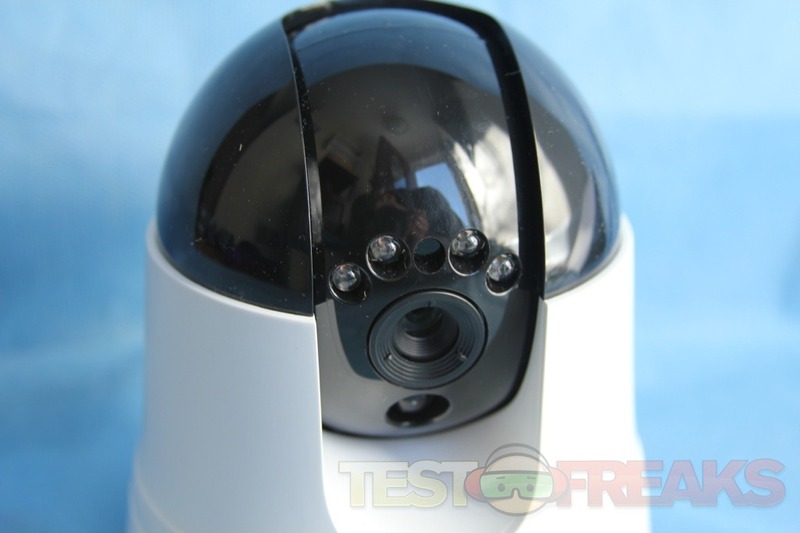 The specs on the camera are quite impressive with a 1/4” Megapixel Progressive CMOS sensor that has 5-meter IR illumination distance, Infrared-Cut Removable (ICR) Filter module, Passive Infra-Red (PIR) and an aperture of F1.9. Of course the camera is only as good as its software. 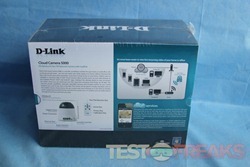 Today we focus in on whether the Cloud Camera 5000 is the total package or lacking in one or more areas. 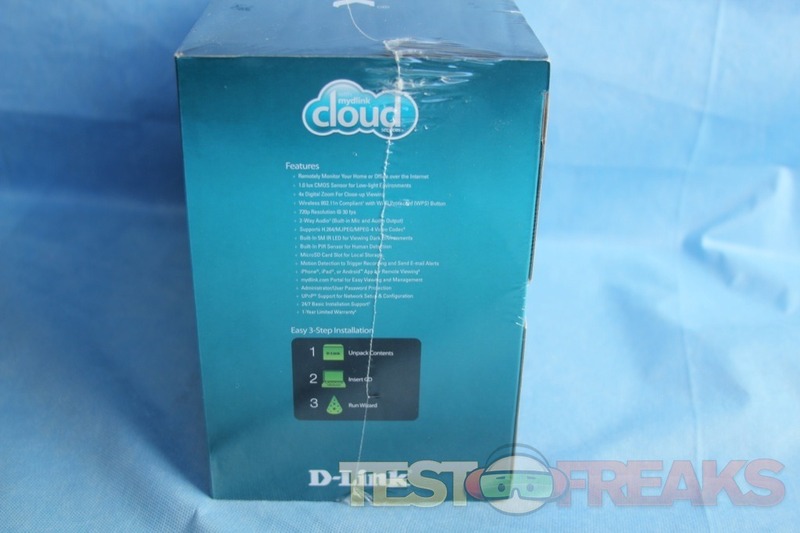 The Cloud Camera 5000 comes packaged in a cardboard box with the familiar D-Link product colors – white, turquoise and black. 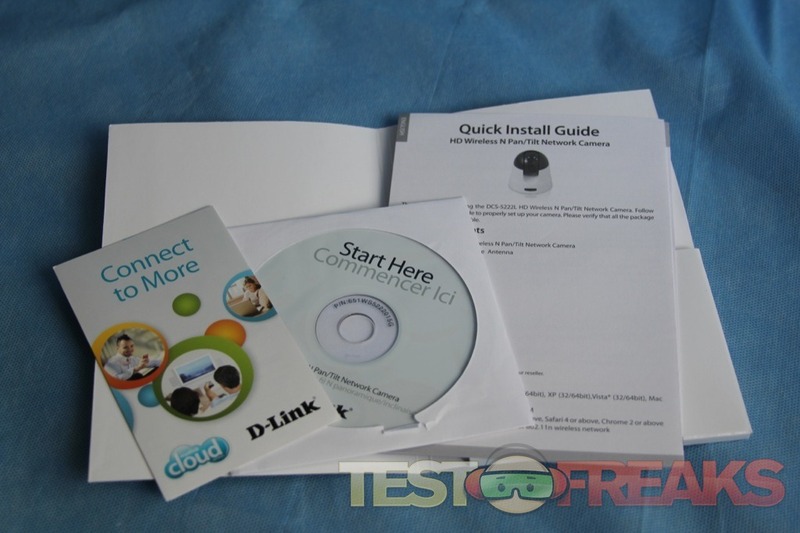 An image of the camera is seen on the front along with a highlight of features, the mydlink cloud logo plus an image of an iPhone and laptop transmitting video. 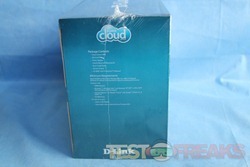 On the sides of the box are a full list of features, package contents, and minimum requirements. 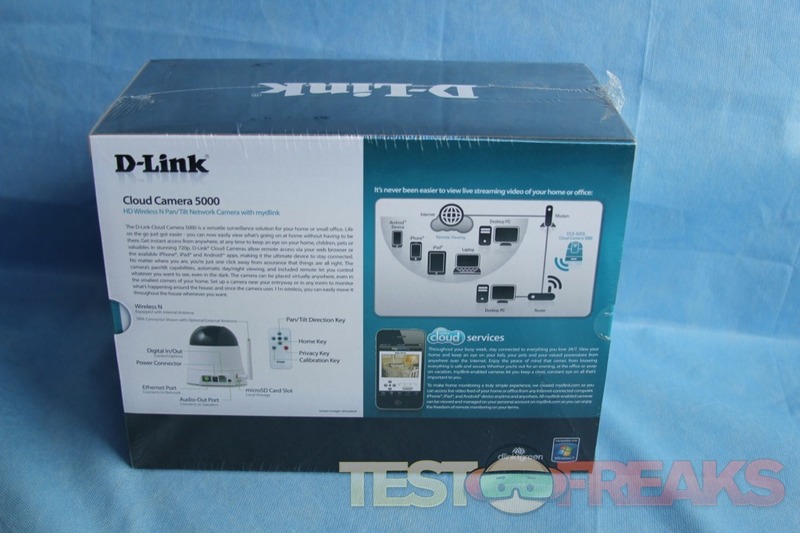 The back of box provides a detailed description of the Cloud Camera 5000, mydlink cloud services and a schematic of how it operates. Inside the box we find the Cloud Camera 5000, Ethernet cable, power adapter, camera base, mounting kit, quick install guide, remote control, wireless antenna and CD-ROM with D-ViewCam software. 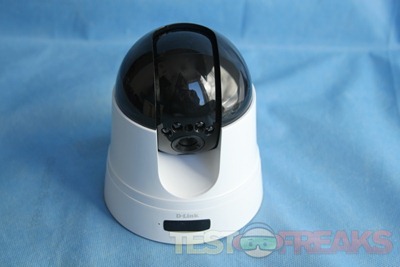 The Cloud Camera 5000 is a composed of white and piano black plastic. It measures 4.46 x 4.46 x 4.92 inches (114 x 114 x 125 mm) and weighs1.19 lb (540 grams). The unit looks like the cross between a Dalek from Dr. Who and R2D2 if it had its legs removed. 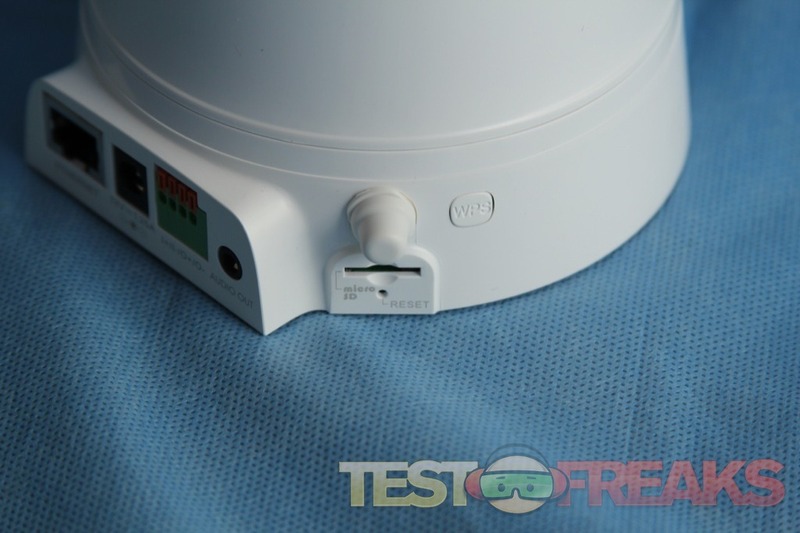 The top is spherical with the camera housed within a white gimbal. Four infrared LEDs are seen above the lens and another LED is located below. 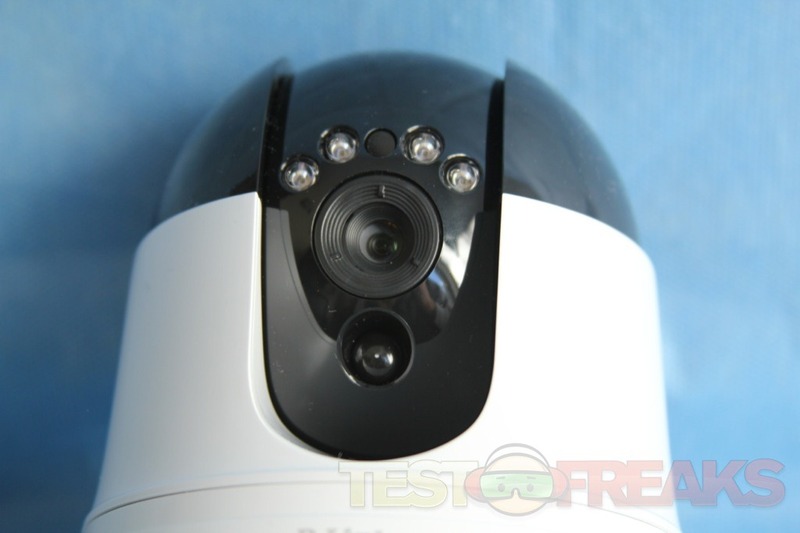 The lower half of the Cloud Camera 5000 is a white base with a central opening for the camera to pan up and down. The D-Link logo is on the front base with two LED lights – one for power and the other for activity resting below. 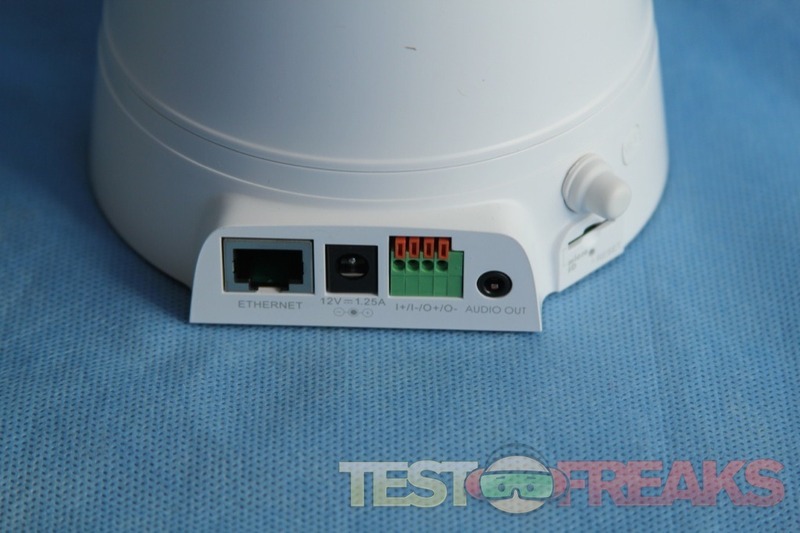 At the rear of the Cloud Camera 5000 are an Ethernet port, AC adapter connection, a series of four input/output connectors and an audio out 3.5 mm jack. To the right of this audio output in a micro SD slot, connector for a wireless antenna, reset and WPS buttons. 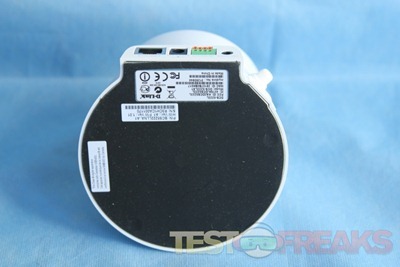 The base is covered by a rubber surface to keep it from sliding about. 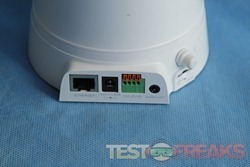 The MAC address and serial number are found here as well. Overall the camera is solidly built. 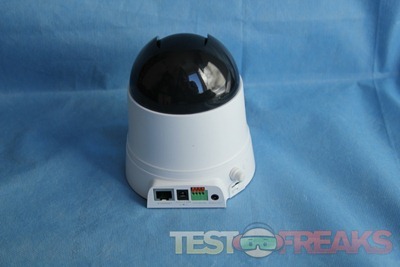 The LEDs on the bottom do make it hard to keep the Cloud Camera 5000 stealth fully hidden. 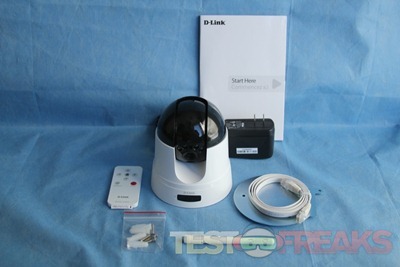 For those who wish to mount the camera, D-Link provides a mounting plate and screws. The remote is a small white controller similar to a Bose style remote. If using a mobile device such as an iOS or Android one, you will probably end up putting this remote in the drawer with the other remotes you never use again. I’ve tried this camera in Xeoma and it works perfectly for me. 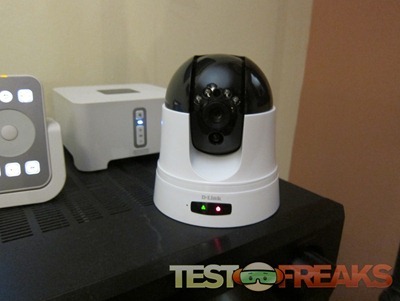 Everything that I need for home vide surveillance.